"How I Will Help You Tell The Story Of Your Child Through Emotional, Sensitive Portraiture..."
"My daughter is so important to me, and you've given me something I will cherish for a long time. You made my daughter feel so comfortable. I still talk about how much fun we had working with you and Patti. Thanks again for everything you've done." Imagine this: I have this great professional photograph I took of our grandson, Bowan. I call it the "tricycle" photograph because Bowan had the cutest little red trike, and he's trying to ride it in the photograph. There's so much heart - so much emotion in this single image. That one photograph means so much to me, I can't even describe how I would feel if I were to lose it. I took this photograph of him when he was only 2 years old, and I remember exactly what the session was like. It was so perfect. And that entire day - that entire moment in my grandson's and my life - is captured in his smile. It's the most real, most tender, most innocent smile, and it's completely HIM. More than any other photograph Bowan has had taken as he grows up, the "tricycle" photograph captured his childish spirit that will always make me smile. Bowan is now 4 years old. What would a photograph like that of your child or grandchild mean to you in 20 or 25 years? There's still time, but every day, their smile changes a little. These Kinds Of Photographs Are Not Accidents. They Are Not Snapshots. And Yet They're Not "Posed" Or Unnatural In Any Way. You know your child better than anyone else in the world. You know his or her "real" smile, and you know his or her "fake" smile. But, you know what? Other people can tell the difference too. We all can. You've seen photographs where you could tell the photographer just posed the child and said "say cheese!" The lighting may have been good. The background might have been nice. But that fake expression that happens when a child is PROMPTED to smile - that just makes the photograph look like a snapshot instead of a special captured moment in your child's life. Imagine How Wonderful Your Child's Expression Will Be When The Photographer Has Become Your Child's FRIEND. Children are very smart. They don't just blindly trust anyone. And they NEVER show their true expressions to someone they don't know and trust. That's why Bowan's smile in the "tricycle" photograph was so natural. He knew me, and therefore he was able to totally be himself. Ever since I took that photograph of my grandson, I've worked very hard to be able to capture those same priceless expressions in other children. In addition to my 14 years as a professional photographer, I also have 14 years of experience as a child psychologist in a way. That's What Makes All The Difference! The Perfect Portrait of Your Child Is Priceless - And It's ONLY Possible If The Photographer Understands How To Work With Your Child To Bring Out Those Natural Expressions. So many photographers actually FEAR children. Well, we can understand that, right? Children can be pretty scary sometimes. Working with other people's children can be very intimidating. For most photographers, they don't even meet your child until it's time to create the photographs. So, your child is sitting there, under all these bright lights, in a strange place, in front of some strange person he or she has never met before. How scary is that? It's no wonder most photographers have to resort to telling children to "say cheese" in order to get any expression even resembling a smile. But That's Not Good Enough. Your Child Is Only Going To Be This Age RIGHT NOW - You Deserve The Perfect Portrait To Capture This Moment In Time Forever. When you find the right photographer, a photographer who doesn't merely understand photography, but also understands how to capture your child's best expressions, you have found a new friend you will value for the rest of you life. This photographer is going to do something for you that no one else in the world can ever do ---- This photographer will STOP TIME, A MAGIC MOMENT and capture cherished memories that you'll be able to relive every day of your life. Nothing means more to me than family memories. No one (other than maybe the rest of your family) understands what your child means to you more than I do. That's one of the reasons I became a professional photographer - I want to help other parents hold on to their family memories forever, and never regret not having a special photograph of their child created. "At first, I was a little skeptical about investing in a portrait of my son. I thought I'd just have my sister, Kari take his picture - she's pretty good with taking snapshots. Then, I read your 100% guarantee. I'm glad I decided to give you a try. The portraits you created are beyond belief! I couldn't be happier." Question: "Just Suppose Someone Were To Create The Perfect Portrait of Your Child - One Where Your Child Looked Better Than Ever, Happier Than Ever - A Portrait That Meant The World To You - What Would That Be Worth?" No price tag can be put on your family's memories. They are and always will be priceless. So, why would you ever want to gamble with those memories? It's just a question of whether you believe a portrait of your children could really mean that much to you. The Photographer You Choose Should Care About YOUR FAMILY AND YOUR MEMORIES, Not Just About "Making A Buck" Off You. Patti and I pride ourselves on becoming a friend of every child we photograph. I didn't get into photography to get rich. Believe me, there are better (and easier) ways to make a fast buck. I actually went to school for Telecommunications. I could be making a WHOLE lot of money if I'd stayed in that line of work. But I CHOSE to become a professional children's photographer. Why did I make that career choice? Because I finally realized that all the money in the world meant nothing to me if I didn't feel like I was making a difference. I Realized That Childhood Memories Were Priceless - That There Was No More Noble Or Wonderful Profession Than To Become A "Memory Giver." I didn't become a photographer because I liked to take photographs. Don't get me wrong, I do like the "art" of photography, but that's NOT the reason I first picked up a camera. As a child, my mother and father didn't have many photographs taken. My entire time growing up, I can't remember a single photograph being taken of just the three of us together. But, early in my career, I created a portrait of my mom and dad together. I cherish that photograph - it means the world to me. As I grew up, and my father became ill, I cherished the memory of the moment that photograph was created even more. Now that my mother has passed away and my father is in an Alzheimers care center, that photograph is priceless. I can't even imagine what it would be like not to have that photograph. It is one of my most prized possessions. Now, I Have A 2nd Chance, And I Swore I Would Be Sure To Capture The Memories Of My Children and Grandchildren Through Fine Portraiture. Time is the one thing that none of us have enough of. It's the one thing that money can't buy. It's the one thing that we all would give just about anything for. Through photography, we can hold on to the moments in our lives that we wish could last forever. And, if it's done correctly, these same photographs can become works of art that we display in our homes for everyone to see and share. "Wayne, your photographs are perfect! Everyone who comes into our home says how great our son looks, and what a wonderful photograph it is. I look forward to having another portrait of him created in a couple of years." Don't worry. I'm not going to try to "sell you" on working with me. I'm already very busy, and I don't need to pressure anyone to work with me as a photographer. I'll just talk to you about your portraits, and help you discover what your photographs could be like. If you decide to have me create your portraits - great. If not, no problem. ...but then, just like the other parents on this site, something made you decide to check out my website. You probably saw some of the children's photography I've created and said to yourself "that's what I want." Maybe you realized that this portrait of your child is so important, you're not going to trust it to just anyone. Believe me, you've made the right choice. By reading this far, you must at least be considering having a portrait of your child created. Well, that's great - you will probably never make a decision that will bring you more lasting joy. However, there are some things you NEED to know before your son or daughter steps in front of any camera. By the time you finish reading this webpage, you will know everything you need to know about how to have the perfect portrait of your child created - the one you will cherish forever! There are 6 VITAL things you must look for in a photographer! If your photographer is missing any one of these things, your child's photographs will be much less than they should be. Demand that your photographer does each and every one of these things! You may feel like having a children's portrait done is going to be a lot of work on your part. Well, it isn't! As long as you know the information on this website, it won't be any work at all on your part. ....So, let's jump right in! 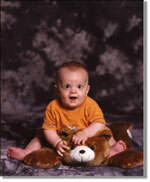 Demand That Your Photographer GUARANTEE You Will Love Your Child's Portraits. If Your Child Doesn't Look The Happiest & Best He Or She Has Ever Looked In These Photographs - If You Don't Feel the Emotion When You Look At Them - You Don't Pay Me For Them. That's my guarantee and personal promise to you. As far as I know, there's no other photographer around that will make you this super of a guarantee. These photographs will be completely meaningless to you unless they convey the real emotions and personality of your child. That's the only real reason to have a children's portrait created. So, if FOR ANY REASON you feel that the photographs I create for you are anything less than what we conferred on - if you don't feel the emotion when I show them to you for the first time, you don't pay me for them. It's that simple. Obviously, I'm totally confident that the portraits I create for you will be well beyond anything you imagine. I believe completely that these photographs will become your most prized possessions - that, if your house were on fire, you would grab them on the way out of your burning home. This is not arrogance. I can't stand arrogance. No, this is a complete belief in my abilities to capture natural, real emotions from children on film unlike anyone else. That's what I've devoted my life to, and that's why I can't wait to photograph your child for you. 1st - At NO CHARGE, I will photograph your child again, and make sure that anything that wasn't perfect is fixed, without you paying another cent. 2nd - If I am absolutely unable to thrill you - if I'm unable to create a photograph that you feel you will cherish forever, I will refund EVERY PENNY you invested in them. You don't pay for your photographs unless you love them beyond expression! If I don't end up being your photographer, make ABSOLUTELY SURE your photographer offers this strong of a guarantee. If they are professional and really good at what they do, they should back up their work by taking all the risk off of you. Meet Your Child, And Become His Or Her Friend - Ahead Of Time - BEFORE The Session. No child is going to look natural and vibrant on film if they don't know and trust the photographer. That is just a plain FACT. Plus, besides making the photographs turn out so much better, think of how much more fun your child is going to have during the session if the photographer has become his or her friend! There's absolutely NO REASON why your child shouldn't enjoy having these portraits created. In fact, if your child is NOT having fun, the photographs will not turn out well at all. 14 years ago, I made a decision. I decided then and there that I would NEVER do a photographic session without meeting the child ahead of time. That single decision has made more of a difference to my clients than any other decision I've ever made. THERE'S NO COST FOR THIS PRE-SESSION MEETING, and it will only take about 15 minutes, but by the time those fifteen minutes are up, you and your child will be so comfortable with me that when I do the actual session, the expressions will be perfect, natural, and priceless every time. If I don't end up being your photographer, make ABSOLUTELY SURE your photographer will meet with you and your child ahead of time, and AT NO CHARGE. I can't stress enough what a difference this will make! AT NO EXTRA CHARGE, Your Photographer Should Create The Images ON LOCATION Instead Of In A Boring Studio. This is such an important point - for so many reasons! First of all, as I mentioned earlier, one of the biggest challenges for a photographer is making your child feel totally comfortable, thereby getting totally natural and fun expressions on film. Well, in addition to meeting the photographer ahead of time, one of the best things for your child is to create the photographs in a location that is familiar or fun for the child. Where's the place most children are the most comfortable? IN OR AROUND THEIR HOME. Imagine being a child, and instead of going to some "scary" studio somewhere, the photographer comes to your home, and creates fantastic photographs right there in the home or in your own backyard! How great would that be? Think of how comfortable and "at home" you would feel as a child. Or, suppose going out to a park somewhere, or to the beach, or playing a pile of leaves - and having the photographer take your photographs there. Not only will your son or daughter have more fun being photographed this way, but it will also be a much more personal and unique setting. There's nothing personal or exciting about a photograph taken in a studio. The setting will look just like the settings of hundreds of other child photographs. Yes, I can create images in my studio if you would like. But For A Small Location Fee, I will come to your home, or take you and your child to a couple of locations in and around the Monticello Area that are perfect for this type of photography. You'll have options - we'll do some in the studio, and some on location. You see, not only do I not mind doing location photography, which takes more work on my part - I actually ENCOURAGE it. After 14 years of photographing children, I know that location photographs tend to be the photographs that parents like the most. If I don't end up being your photographer, make ABSOLUTELY SURE your photographer will create images on location as well as in the studio, and AT NO CHARGE. "Looking For George" - A Great Game To Help Your Child Feel Totally Comfortable, So He Or She Will Look Great. Now, this is something no other photographer around does. If your child is being photographed in the studio, this is a great way to make him or her totally comfortable - and to insure they have fun. You see, I have this wonderful, big, fluffy, warm, fuzzy, INVISIBLE puppy that lives in my studio. Really, I do. His name is George. And he LOVES to play hide and seek with children. When you and your child come to the studio for the session, I'll immediately tell your child about George, and tell him or her to start looking for George. It's a wonderful game, and it puts them at ease right away. You should see a child's eyes light up when I tell them about this loving soft invisible puppy that's running around my studio just waiting to be discovered. Throughout the entire session, if your son or daughter isn't really "getting into the spirit" of the photography, I'll tell them I just saw George running through the camera room. Immediately, their face will light up, and that's when I snap the photograph. Okay, just between you and me, there's no such thing as an invisible dog who plays hide and seek with children. But, once again, the psychology of capturing your child's unique personality on film is what this game is all about. There are variations on this idea, so be sure to ask any photographer you consider hiring how they work with the children. That is even MORE important than the type of camera or film they use! If I don't end up being your photographer, make ABSOLUTELY SURE your photographer does something special to insure your child will have fun and give you great expressions on film! "There's No Rush To Have A Portrait Of Your Child Created Right Now." Before we continue with the 6 THINGS YOUR PHOTOGRAPHER MUST DO, let's talk about this for a moment. So many people think they have all the time in the world to have a portrait of their child created. But, you know how things are. If you don't pick up the phone right now, and at least call me to chat about your child's portrait, you will probably get swamped with other things, and forget all about it. Then, before you know it, a year - two years - five years have gone by. How different will your son or daughter be by then? You see, time is ticking.... and it's never going to stop. First, Your Child Takes His or Her First Step. Next, Learns To Ride A Bike. Later, Gets A Driver's Licence. Graduates From High School. Gets Married. Starts A Family Of His or Her Own. These are precious times, and although things will change, this moment never has to slip from your fingers. Don't put this off. You know how life is. We put things off, and before we know it, everything has changed. If your life is half as crazy as mine is, year after year you find yourself frustrated at the things you wanted to do, and never got done. A portrait of your child - as he or she is right now - is something you deserve. Plus, You Will Save 50% By Acting Right Now! Just suppose you call my studio and chat with me. Just suppose you decide you would like me to be your child's photographer. As long as you are one of the first 43 people to call me (for your FREE chat), I will deduct 50% off the creation of your child's portraits - NO MATTER WHEN YOU DECIDE TO HAVE THE PORTRAITS TAKEN WITH ME! What does that mean? You don't have to actually have the photograph created immediately - just call me to chat. If, after that call, you decide you want me to be your photographer, I'll photograph your child for 50% off my regular fee. Pick up the phone, and call my studio. CLICK HERE for the number. Even if it's after business hours, still call right now. I've got an answering machine that is just waiting to cheerfully take your message, and I'll personally call you back so we can chat. Just let me know when is a good time to call you back. Don't worry, I'm not going to try to "pressure" you at all into working with me. Plus, there's no cost at all for us just to chat. When you call, we'll chat briefly about the things you need to know. I'll tell you a bit about me. I'll answer all your questions about how to prepare for your child's portrait - including things I don't have time to put in this letter. It won't be a long call, but it will be one of the most important calls you make. The Photographer MUST Allow At Least ONE HOUR To Photograph Your Child!! This is a biggie. Most photographers are trying to crank so many sessions through in a day, they only have a short amount of time to photograph each subject. Did you know that the average child photographer spends ONLY 12.5 MINUTES photographing a child?! That's insane! 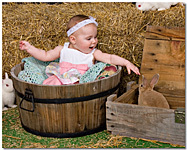 Fine children's photography is like a great meal in a fine restaurant: It CAN'T be rushed. The photographer is like your personal chef, preparing the meal for you. The photographer is going to have to "add all the right spices" into the photograph to make it just right. This takes a bit of patience, and a lot of focus. If your photographer knows that in about 15 minutes the next client is going to show up, you're not going to get the attention you deserve. Now, it may not take the whole hour to photograph your child. However, I ALWAYS set aside at least 2 hours for every child session I book. I've done some sessions that only took about 20 minutes or so to get a number of stunning images, but the point is - it's vital to leave that much time open. Don't let your photographer rush through this. Remember, these are your memories, and it's up to you to make sure your photographer realizes his or her responsibility to you and your child. If I don't end up being your photographer, make ABSOLUTELY SURE your photographer spends AT LEAST ONE HOUR creating the perfect images for you - this cannot be rushed! Make Your Child Feel Totally Comfortable By Using A Favorite Stuffed Animal, Pet, or Toy. I love this part. You see, this is a two-fold benefit here. It's going to make your child so much more comfortable, and at the same time, it's going to add yet another level of personalization to the final photographs. As you know, children love familiarity. Nothing can calm them down like that "security blanket" they love to haul around the house, or that special beat-up raggedy old stuffed animal that Grandma gave them on their first birthday, or that cherished family pet that is like their best friend. Imagine the wonderful photographs that will come from allowing your child to play with something that is so special to him or her. Some of the most emotional and memorable portraits I've ever created involved a child playing with a toy or a pet or even a family music box. We've all seen children almost seem to "slip into another world" when they play with certain things. Those are the moments I live for, and those are the moments I'm going to capture for you on film. If I don't end up being your photographer, make ABSOLUTELY SURE your photographer encorporates your child's favorite toy into the photographs! Do you have a photograph of your child that, if you were running from your burning home, would be the one thing you save (other than your family members, of course) on the way out? Do you have a photograph of your child that means that much to you? Now, I'm not talking about a "snapshot" that was taken during a family outing on the Fourth Of July. I'm talking about a wonderful photograph, created by an artistic photographer, that not only captures your child's true expressions and personality, but also does so in a way that you'd be proud to display in your home for the rest of your life. It's Not Too Late. This Moment, Right Now, Can Be Held Onto For The Rest Of Your Life - For You To Share With Family And Friends. You don't have to make a big decision right now. You don't have to choose your photographer - you don't even have to decide that now is the time for your child's portrait. Just take one small step toward holding onto your child's happiest moments RIGHT NOW. Just Call My Studio, And We'll Chat. And, If You Decide You Want Me To Create Your Child's Portrait, Save 50% Off It's Creation. It's All Up To You. You can call any time. If I don't answer, just leave your name and number at the beep, and I'll call you back. If you're thinking of this photograph as a GIFT FOR SOMEONE, let me know, so when I call back, I only ask for you, and don't spoil the surprise! Once again, CLICK HERE for the direct phone number to my studio. Make the call now. It will be a call you will be glad you made for the rest of your life. I look forward to hearing from you. P.S. - Remember, call us just to chat, and if you are one of the first 43 people, and if you choose to have me photograph your child, you will save 50% off the creation of the images! You've nothing to lose, and so many great memories to gain. Call my studio now - no cost, no obligation - CLICK HERE. The Best Guarantee In The World! FREE CHAT! Call me on the phone, and we can chat about your photography. There's NO cost, and NO obligation. QUESTIONS? You can EMAIL me with any questions you have, and I'll email you back within 48 hours!